Wow! What a month! 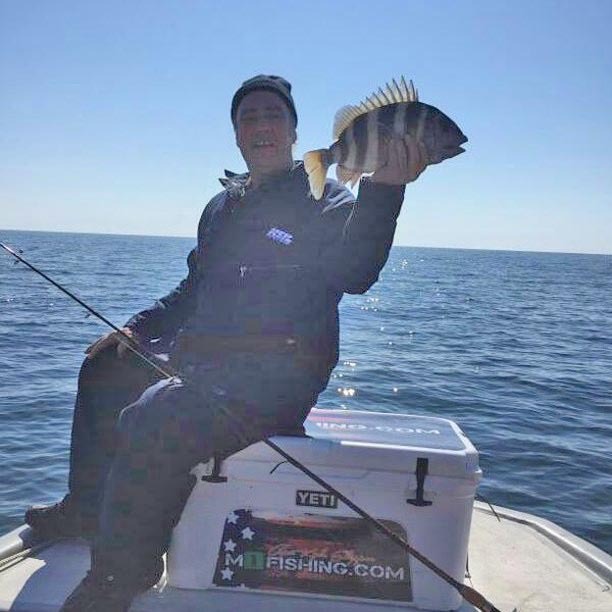 It was a bit chilly early in the month and we had some windy days, but the flats are full of fish and lots of folks had a great time catching them. 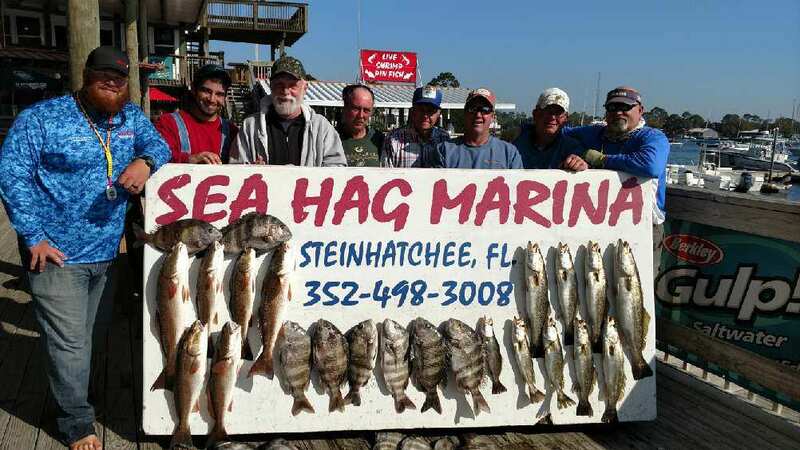 And nearshore, the sheepshead bite was one of the best in years. There were two big tournaments this month and in the forecast I’ll tell you about the 5 coming up in April. 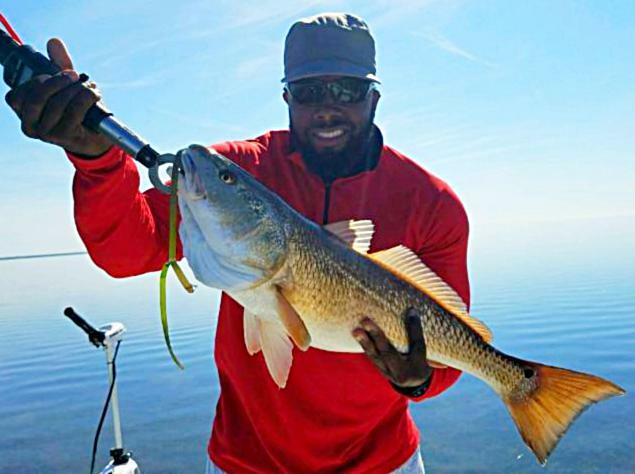 But you didn’t have to be in a tournament to catch some amazing fish this month…just take a look at some of these catches from March. 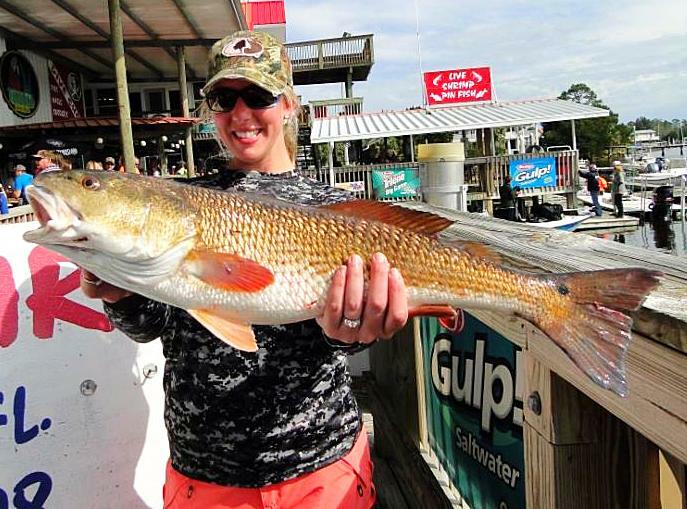 Allyson Willingham with a beautiful tournament-sized redfish. Zach Bunkley, from China Spring, Tx. 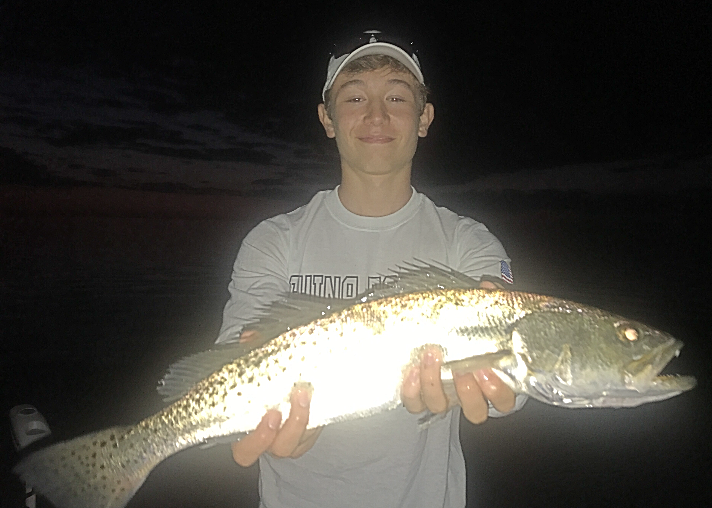 found this nighttime trout. 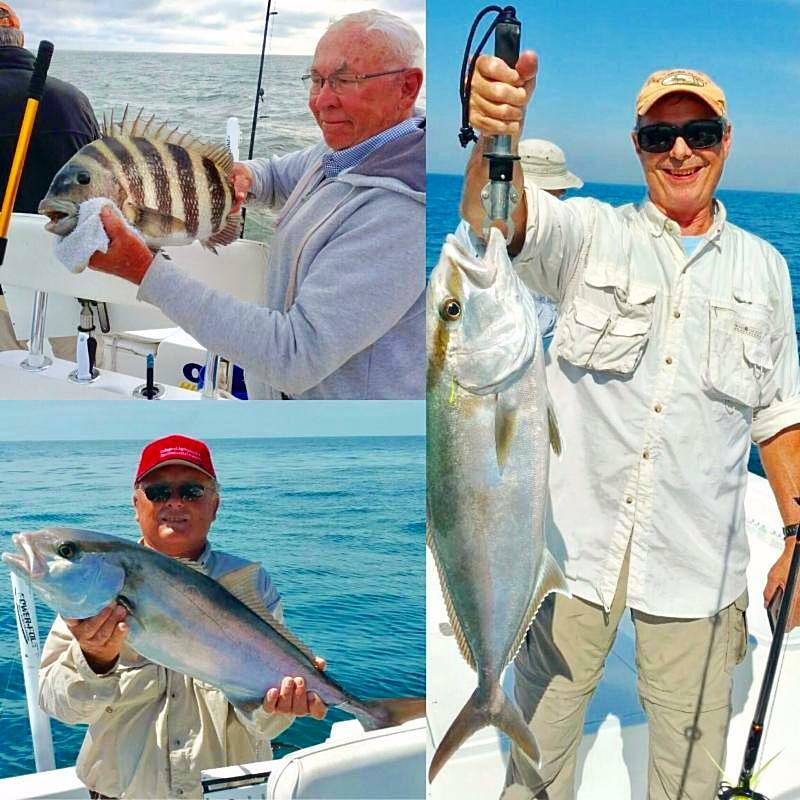 William Robinson from Jacksonville put his folks on some sheepshead and amberjack. 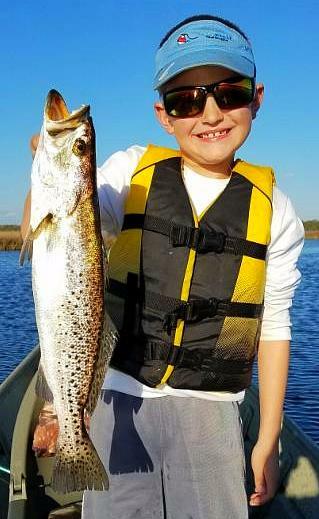 8 year old Wes Tilson from Smyrna, Ga. with his first trout. 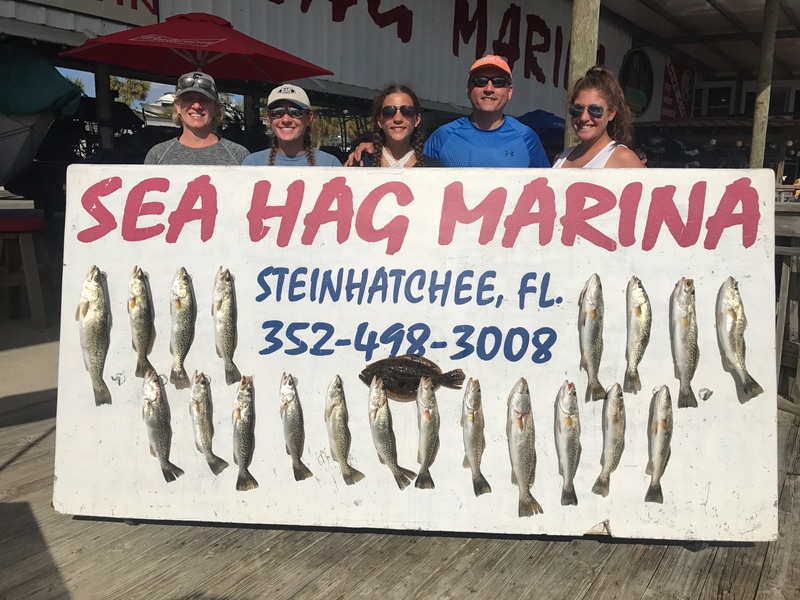 The Waddell and Paris families from Dallas, Ga. got into a school of Spanish mackerel. 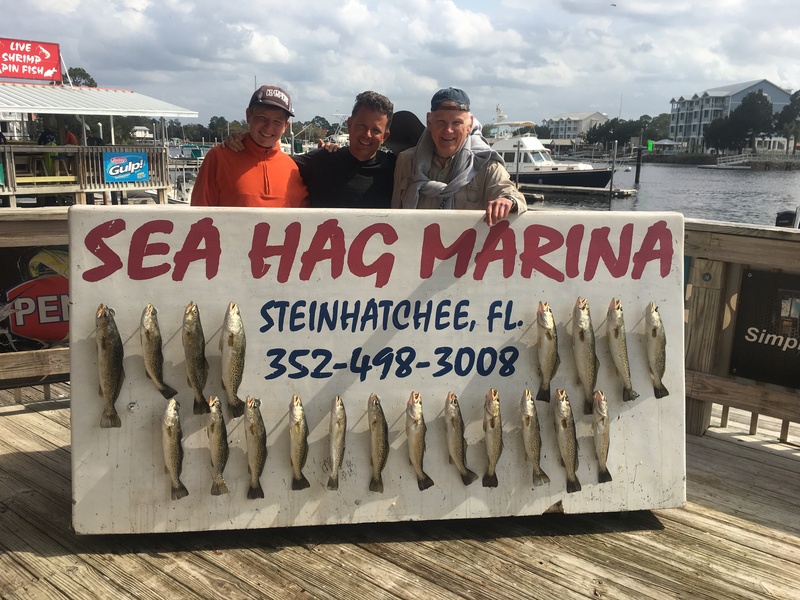 Two Sea Hag teams scored big in the Community Tournament: Rob Monica, James Dechow, Chase Norwood, and Brett Molzen. 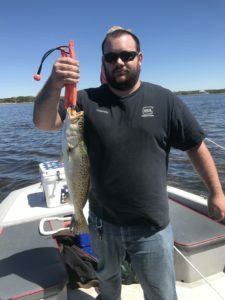 Ryan Beville from Alachua with his gator trout. 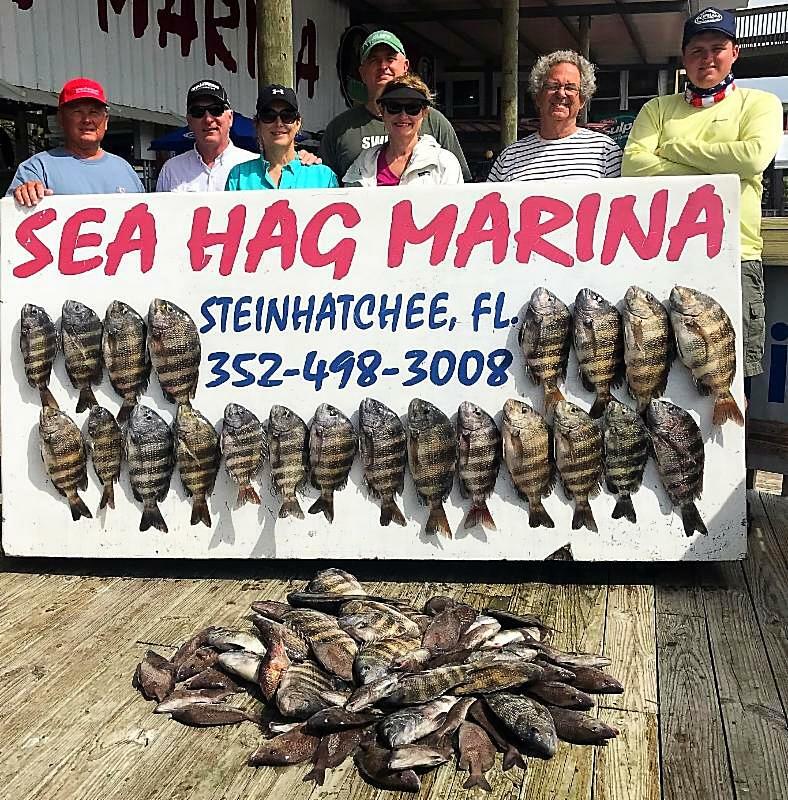 The Pulliam family and Andrew Kinnard came down from Atlanta to catch this great bunch of sheepshead. 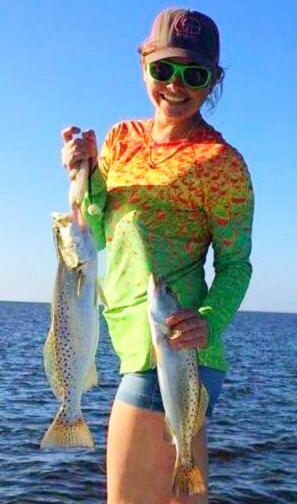 Steinhatchee’s own Melissa Macauley with two fine keeper trout. 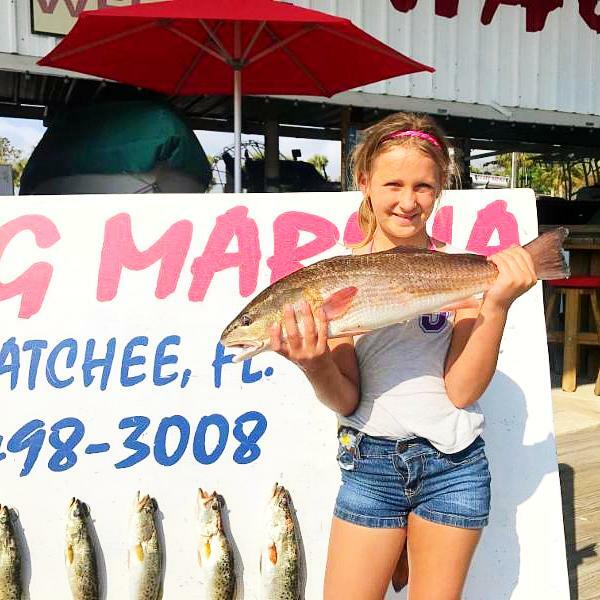 Madyson Jessie had a great time with her family and took this red home for dinner. 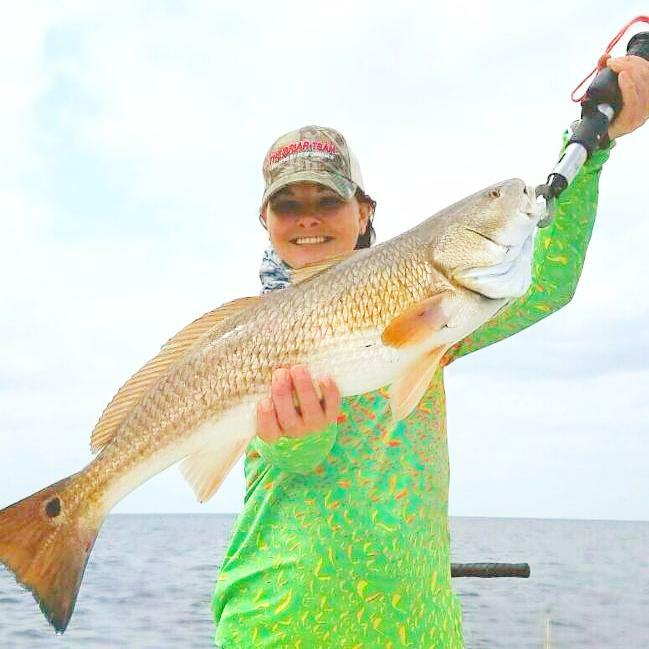 Kitty Mccauley with a huge overslot redfish. John and Kaylee Delgado had a great time over spring break. 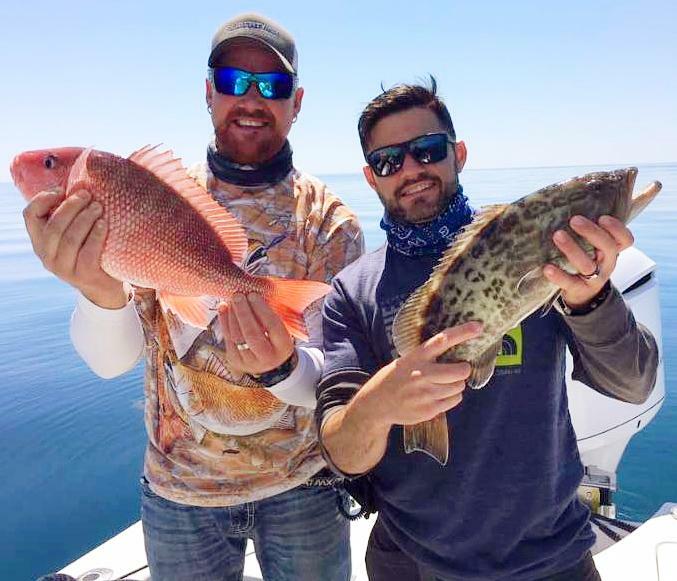 Jim Barnhouse and Phil Farrara from Gainesville caught some fine eating, a gag grouper and a red snapper….but being out of season, they were both released. 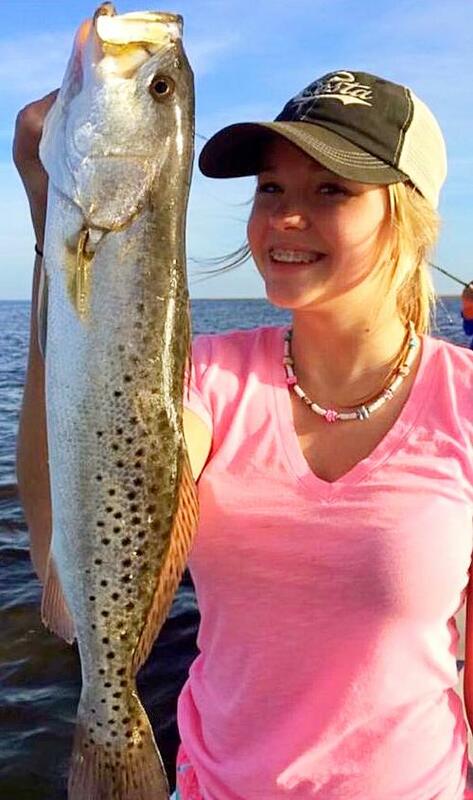 Jade Green from Lake Park, Ga. with her huge gator trout. 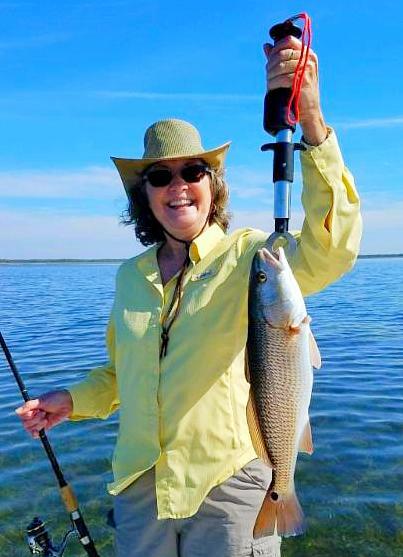 Gloria Jenks from Columbus, Ga. with her redfish and trout. 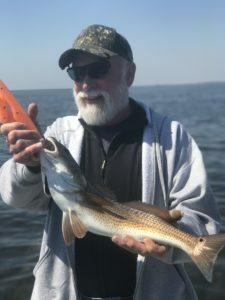 Gary McClain from Gainesville caught this beautiful redfish. 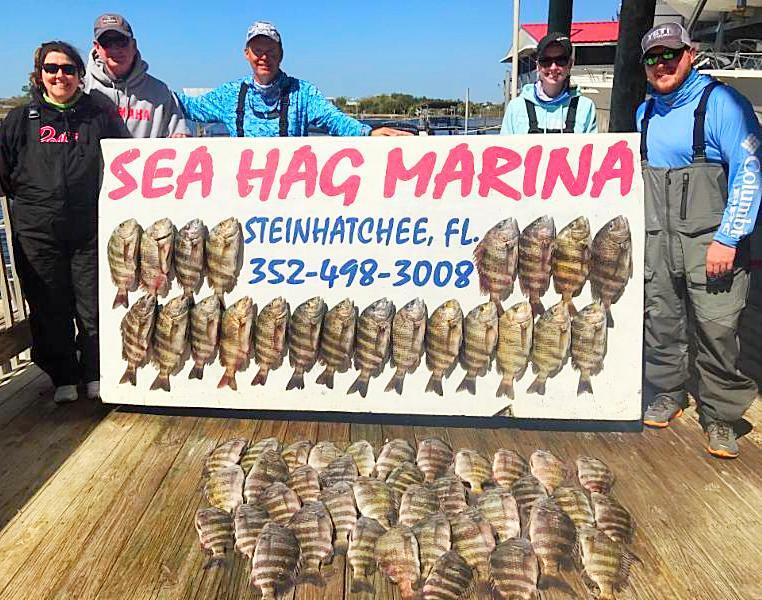 The Frey and Cross families took advantage of a huge sheepshead run this year to bring back some fine eating. 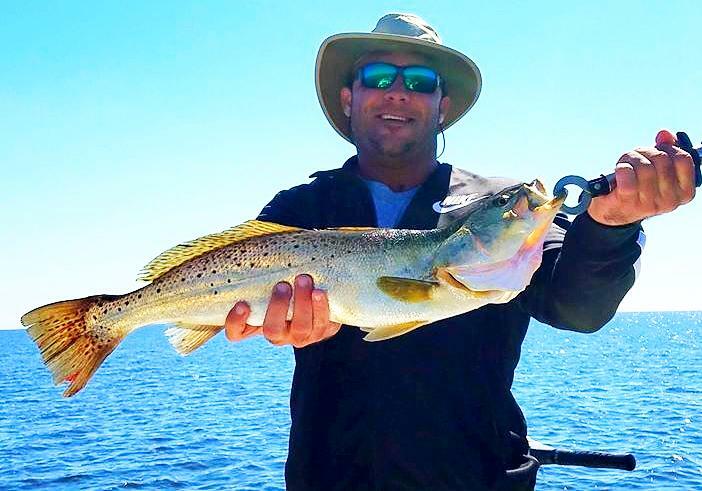 Dustin Murphy put his friend Cody Womack on a topwater trout south of Rocky Creek. 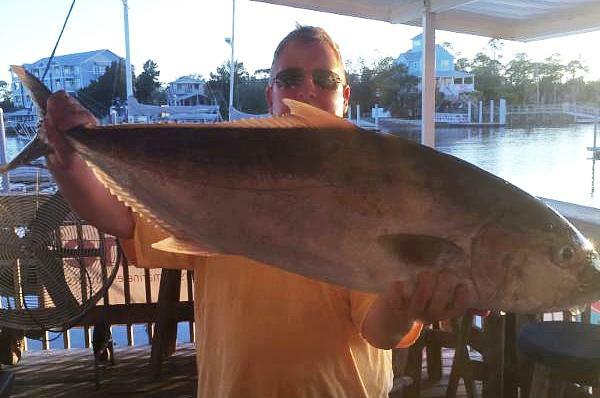 Derek Simpson used a cigar minnow to find this giant amberjack. 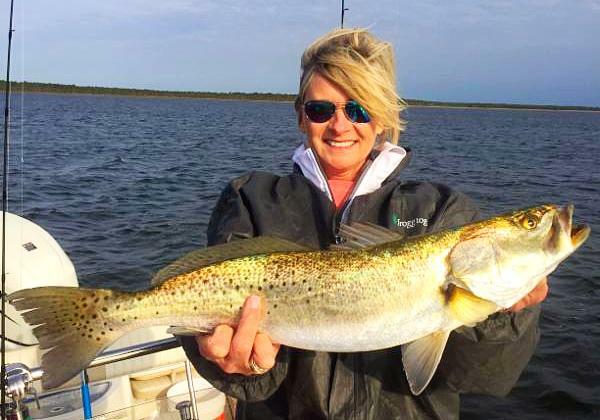 Debra Sheffield came down from Eastman, Ga. to find this monster trout. 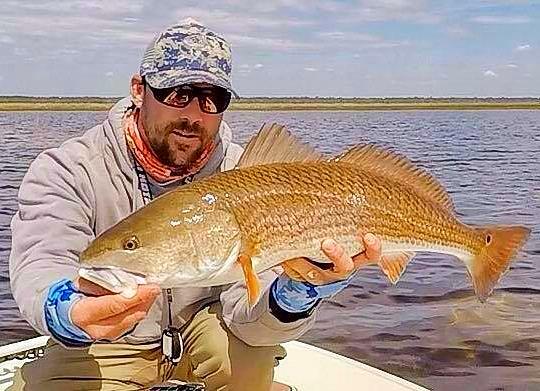 Chad Williams from Thomasville, Ga. with this beautiful overslot redfish. Brad Castleberry from Moultrie, Ga. with yet another gator trout. 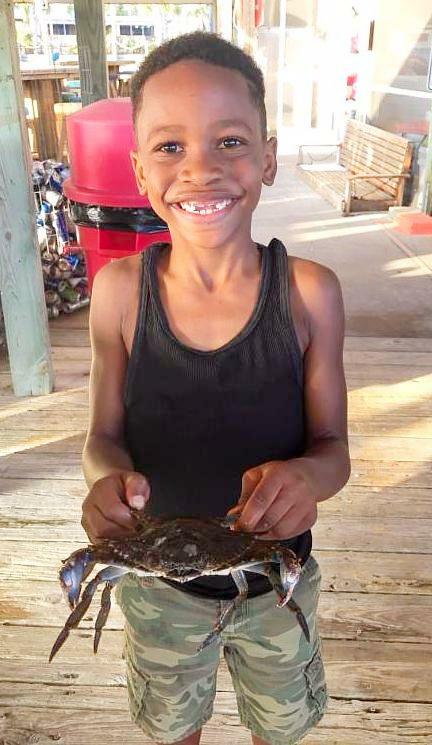 Amir Byars and family came over from Jacksonville and caught bluefish, trout, and this fine blue crab. 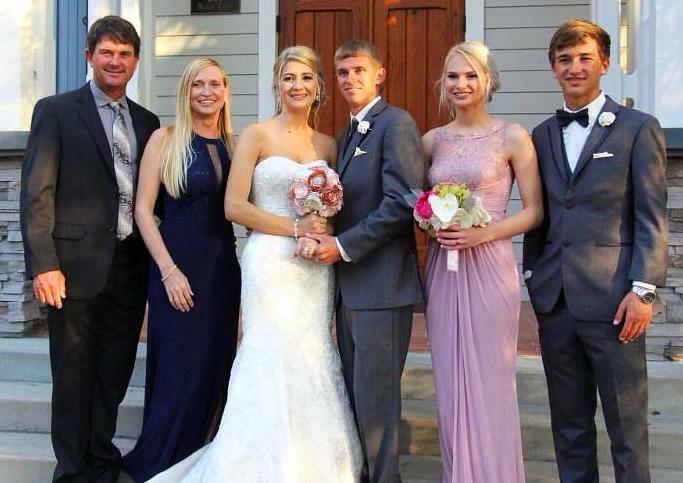 …and finally, one of the best catches of the month: Derek Snyder corralled the beautiful Brittany with the Norwood family in attendance. Congratulations! April will be another great month. 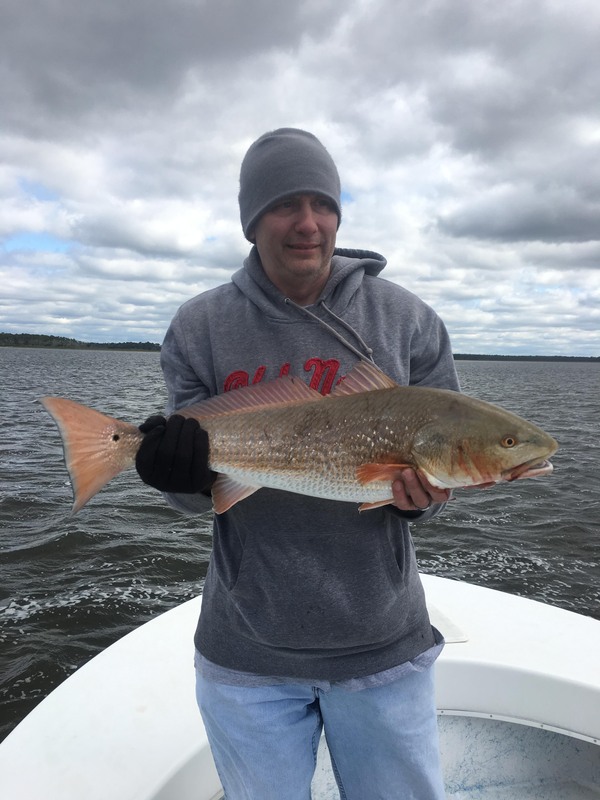 Water temperatures will remain comfortable, so trout will be on flats and nice schools of redfish will be found closer to shore. Sea grasses are coming in and there are pinfish starting to populate the flats. I saw some large schools of whitebait, from the tiny glass minnows to large pogies during the last week of March. 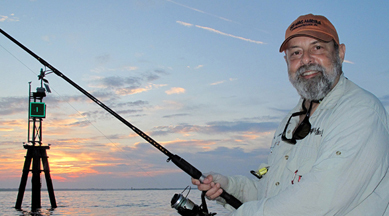 Spanish mackerel have already begun moving through heading south, along with kingfish and cobia. 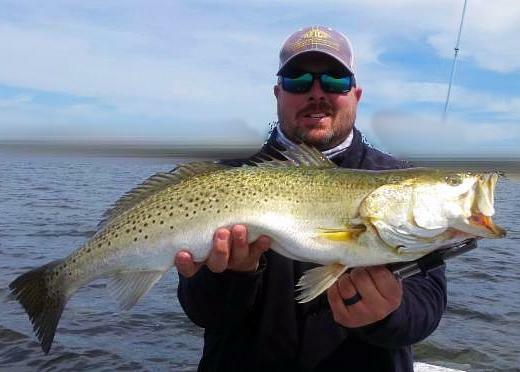 If you spend much time on the water this month, you’ll find lots of baitfish schools being blasted by mackerel, trout and bluefish. Troll using Clark spoons or bucktail floreo jigs, and don’t forget the wire leader. 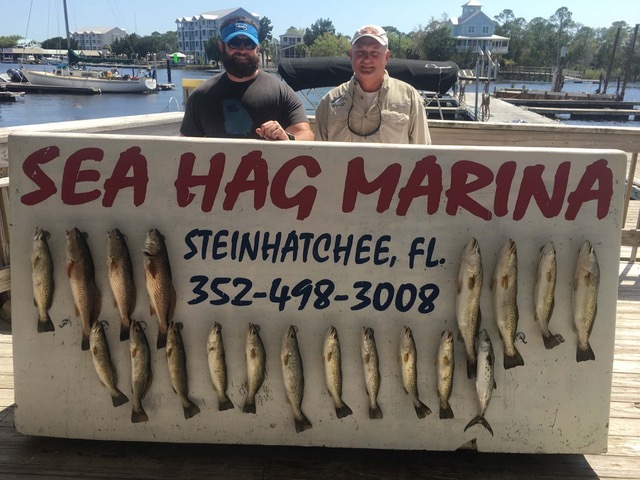 Baitfish will hand around some of the nearshore bars like 9 Mile and Little Banks. Further out, sheepshead may stick around for a while, but if you want them, head out really soon. 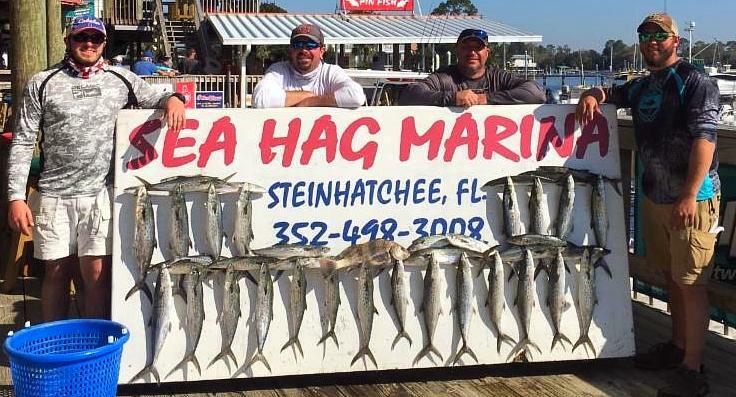 And always try to keep a live bait out on a float to prospect for kingfish or cobia. 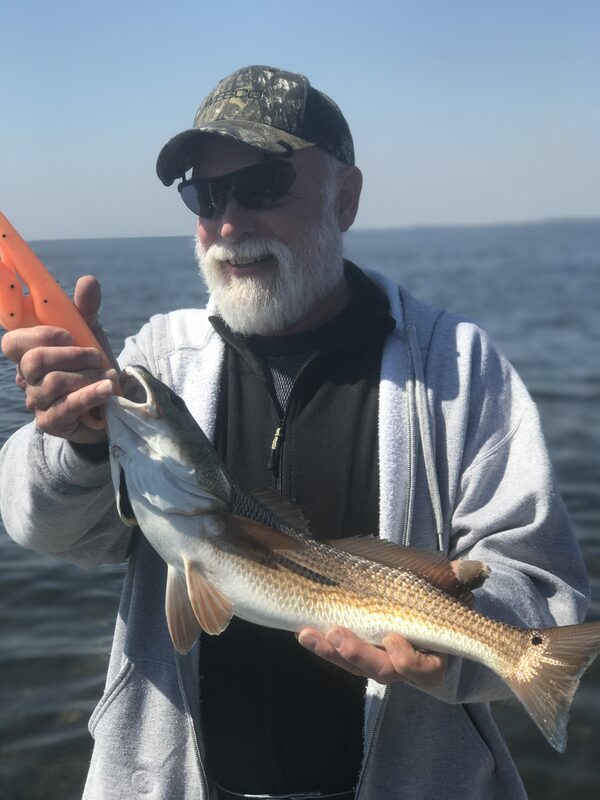 Fish for trout on the flats with popping corks and either live shrimp or Gulp baits; or some of the great soft plastic jigtails you can get at the Ship’s Store. Fish sandy holes on the grassflats for keepers and use topwater lures closer to shore in the mornings to find larger trout. 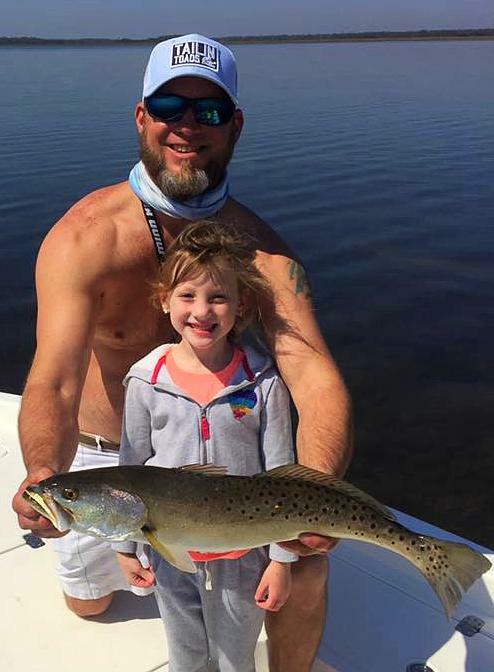 Some of the best areas are around the bird rack to the north, and the bars outside of Dallus Creek; to the south, areas south of Rocky Creek down to Tater Island and Sink Creek, and the old standby, Pepperfish Keys, will all hold trout. 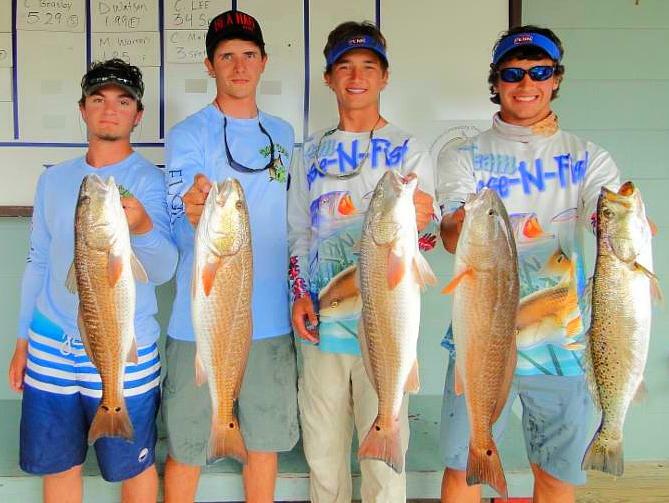 Redfish will be schooling in shallow areas around structure. Fish with gold spoons, jigs with Bass Assassin tails, or Live Target baitballs and sardines. 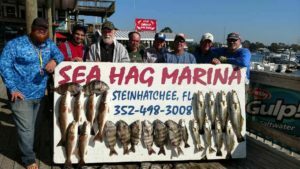 Some of the areas to try include Rock Point and Fisherman’s Rest to the north, and Sand Point, Hardy Point and Tater Island to the south. 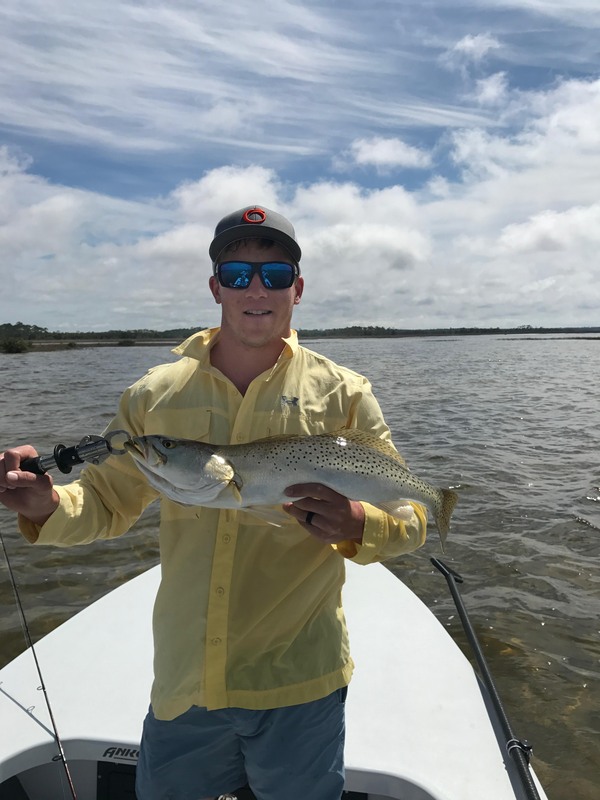 If you don’t mind the run down to Pepperfish, the shoreline behind the islands can be a great place for redfish, but you must know your way around that rocky area. If you’re interested in tournaments, we’ve got ‘em. 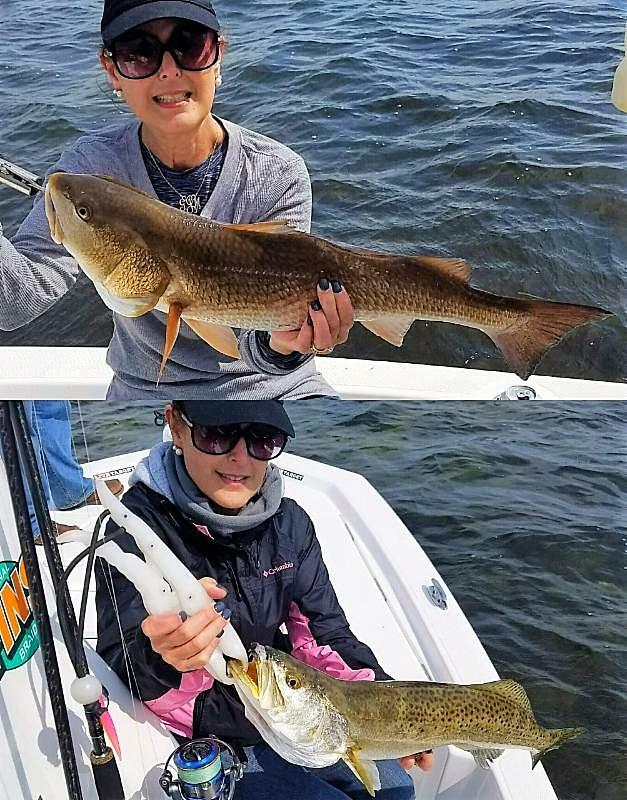 April 8- Greg Bishop Memorial Tournament; April 15- Reeling for Rescues; April 22- Bell Bulldogs Tournament; April 29- Shands Fishing for Kids Tournament. For more information about any of these events, call the Ship’s Store at 352-498-3008. 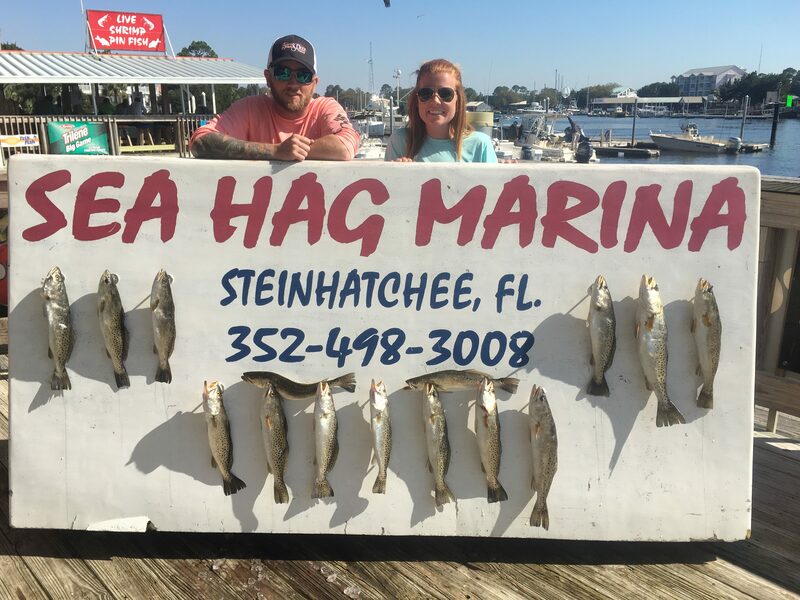 With comfortable temperatures this month and great fishing, you need to get out this month and take advantage of what Steinhatchee offers. You can get all the tackle mentioned, plus live shrimp, at the Marina’s Ship’s Store. Go fish! I have to say other than the wind, March was a great month for trout. The water temp stayed in the 60’s for the most part and the trout and reds responded. Most of the month the fish stayed active and on the flats. Very few days did the better fish move into the creeks and the ones that did were smaller fish. April looks to be red hot, too. Lots of trout and reds and in the last few days the Spanish have showed up.